This so called groupie-ness, coupled with a deep, fundamental desire to help people and the environment, was the basis for IOI, an organization dedicated to creating environmental stewardship in communities that support some of the most ecologically diverse marine habitats on Earth. It all began in April 2005 when Besserer, then a Marine Affairs and Policy graduate student at the University of Miami’s Rosenstiel School of Marine and Atmospheric Science, traveled to Belize for an anthropology spring break course with Dr. Sarah Meltzoff. It was an ‘ah-ha’ moment in the purest sense. Eager to deepen this understanding, Besserer immediately signed up for Dr. Meltzoff’s next trip to Latin America, which happened to be to the Galapagos Islands. It was Besserer’s time there, in the small village town of Puerto Villamil on the island of Isabela, that set IOI in motion. At this time, sea cucumber fisheries were a high value fishery on Isabela, and there were few opportunities for work outside of this ecologically harmful industry. These people need alternatives, Besserer thought – for conservation’s and social stability’s sake. Upon returning to Miami, this idea became the topic for his graduate thesis, titled: “Establishing a Non-Profit organization to Benefit Education and Conservation in the Galapagos Islands.” The premise (including an annex that read much like a business plan) centered around the notion that introducing tourism, and educating local populations about sustainability and conservation, could have long-lasting, positive effects on their communities and ecosystems. Pretty soon, Besserer was back in Ecuador writing his thesis, and what began as a three month research trip quickly turned into six. He began working with an Ecuadorian University that wanted to establish the “biggest and best oceanographic institute in the tropical eastern pacific,” calling it, the Isabela Oceanographic Institute. Besserer, who had been an international business administration major in his home country of Germany, established and ran their corporate social responsibility program. After 15 months (working from their base in San Cristobal) it was clear that Besserer and the University had extremely different objectives for the project and that it was time for him to move on. The next few months were a whirlwind. In the same weekend that Besserer said goodbye to the work he had been doing for nearly a year and a half, a colleague, understanding Besserer’s vision for sustainable education focused social development and conservation, suggested that he speak to the local priest in Puerto Villamil. This meeting, coupled with the support of a few coincidentally visiting professors of another Ecuadorian University, opened doors to a new partner, and new facilities. As it turned out, Angel Calderon, the local priest, needed help renovating the abandoned mission in the center of town. Besserer stayed for the next year, fundraising, recruiting the support of family and friends, and—even though the organization didn’t officially take on its current name until April 2013—establishing the Intercultural Outreach Initiative. 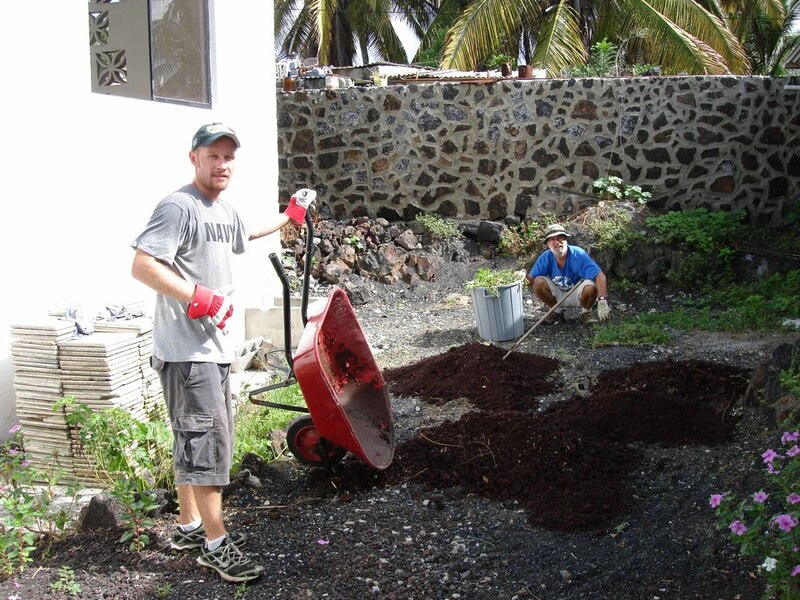 After renovating the abandoned mission in 2007, and keeping the entire organization alive with odd jobs ranging from trucking across the United States to being a chauffeur during the Miami Superbowl in 2007, Besserer realized that he needed a more sustainable source of income. He recalled how he ended up in the Galapagos in the first place, and in the holiday intersession of 2007-2008, IOI opened its doors to study abroad groups. Study abroad is now IOI’s largest and most important source of income. The very things that led Besserer down the path to founding IOI, are also the aspects of the program that its primary supporters now appreciate the most. Education, experience, and most importantly, the invitation to change your perceptions. Besserer was born and raised in Germany, and the last thing he imagined as an undergraduate business major was that he would come to the United States and start a nonprofit in Latin America. Alas, here we are. In 2012, Besserer handed over operational responsibility to a local director, and through an organization-wide restructuring, defined IOI’s areas of intervention more clearly, and developed standard procedures for its processes ranging from salary standardization to support project application formats. Today, Besserer is based in Miami where he is pursuing his PhD at the University of Miami, and overseeing IOI’s more strategic, legal, fiscal, and developmental tasks. That professor, Dr. Meltzoff, who originally took him to the Galapagos, sat on the board of IOI for 10 years, and like many others, continues to support the organization as it grows and develops. It is clear that for IOI, and its founder, this is just the beginning. Newer PostDon't You Just Love Puppet Shows?